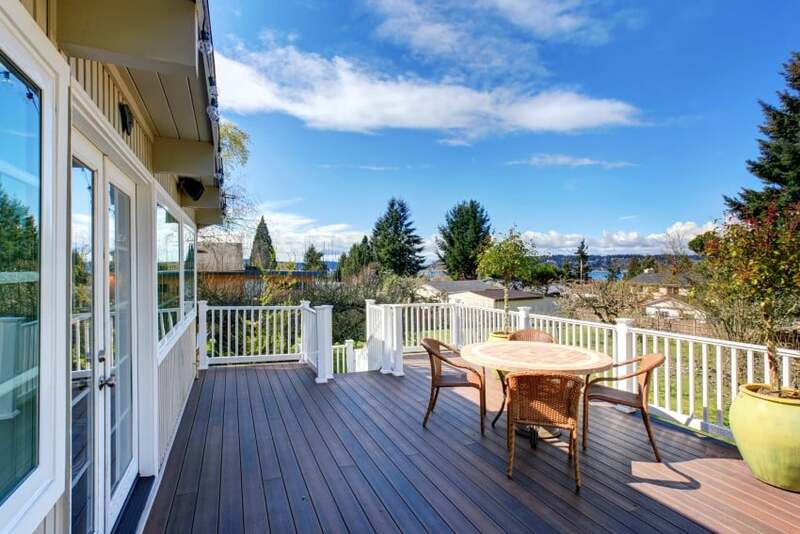 A good-looking wood deck is an important part of a beautiful home design. 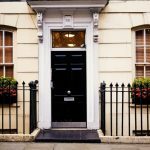 A nice front porch can significantly boost the curb appeal of your house, while a private deck in the back can be a great addition to your landscape design. 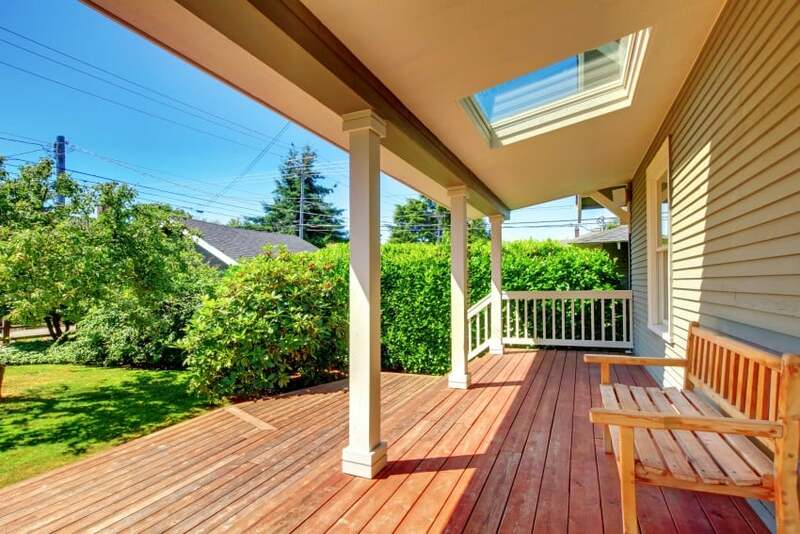 A wooden deck is the perfect way to get yourself some extra living area. 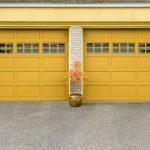 There are layout options and many design possibilities when it comes to furnishing your outdoor space. It is always a good idea, however, to have some comfortable seating options for the whole family. An outdoor lounge area is one of the possibilities. You could easily get yourself a nice set of armchairs and a sofa where you could relax and enjoy a sunny afternoon. Just don’t forget about adding an umbrella or two if you are not much of a sun person! A dining area in your backyard is another cool alternative. A large dining table that can sit the whole family plus friends is always great to have. There you can host a dinner party, just be sure to also get yourself an outdoor grill, fire pit or a whole pizza oven! Choosing between a lounge area and a dining corner can be a tough call. If you are lucky to have a larger wood deck or you are in the process of designing a new timber deck, then you may be able to accommodate both (and even have some spare room left!). Otherwise, you would just have to think about what you need most. Whatever you choose to go with, don’t forget to research creative design ideas beforehand. You may just find something that you like! 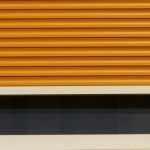 To make things easier for you, we have even put together a great collection of wood deck design ideas. Make sure also to read till the end of this article to find free deck plans for your project. This wooden deck with a corner bench may be simple in design, but it inspires a sense of comfort and peace. 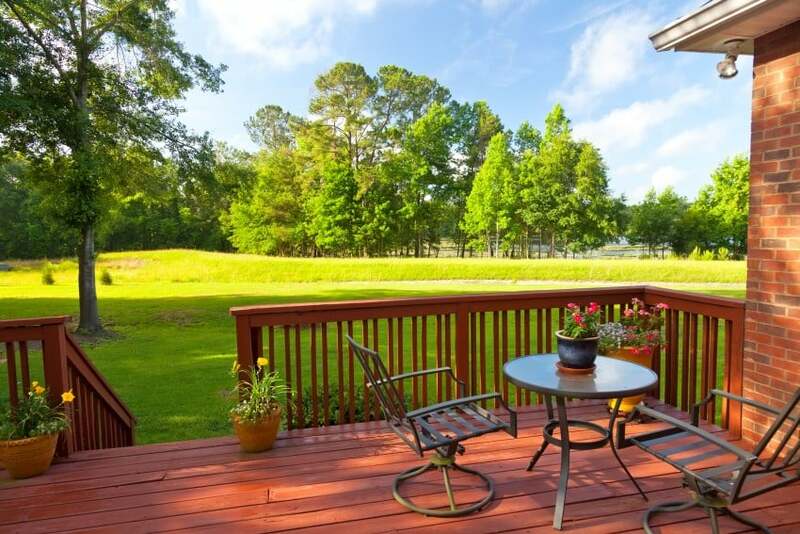 Plus, it has a beautiful view at a lush green forest right there in the backyard! 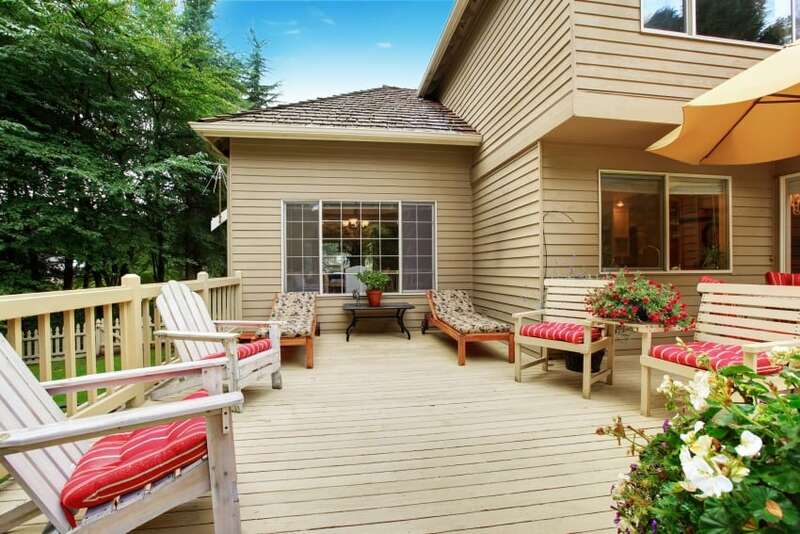 Here is another wooden deck attached to a suburban house. It is set on an elevated platform and accommodates a pair of chairs with a small table. A bright red umbrella adds a color burst and offers protection from the sun. 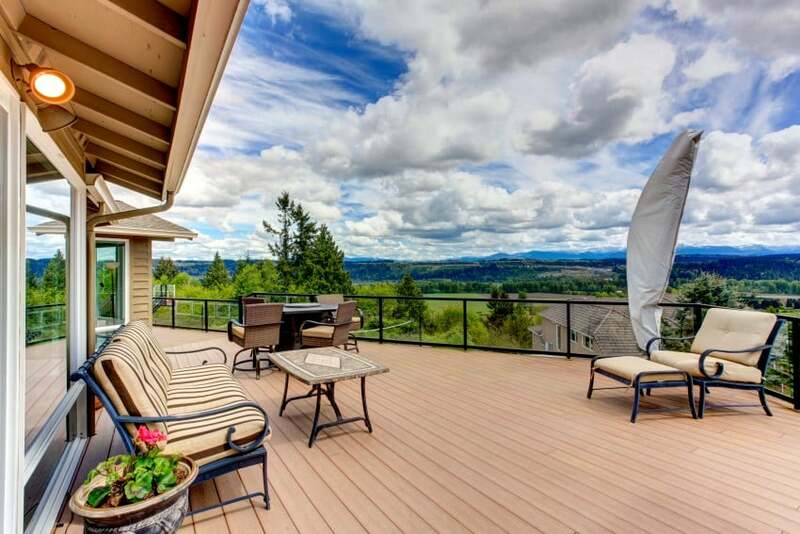 This large deck overlooks a stunning landscape view. It may look rather empty as it has yet to be furnished but once that’s done it is sure to become a cozy outdoor space for the whole family. 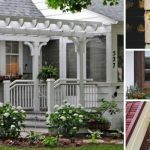 A front porch with a roof is always a nice feature in a house design. It is a convenient place for a small bench where you could sit for a while and have friendly neighbors over for a quick chat. 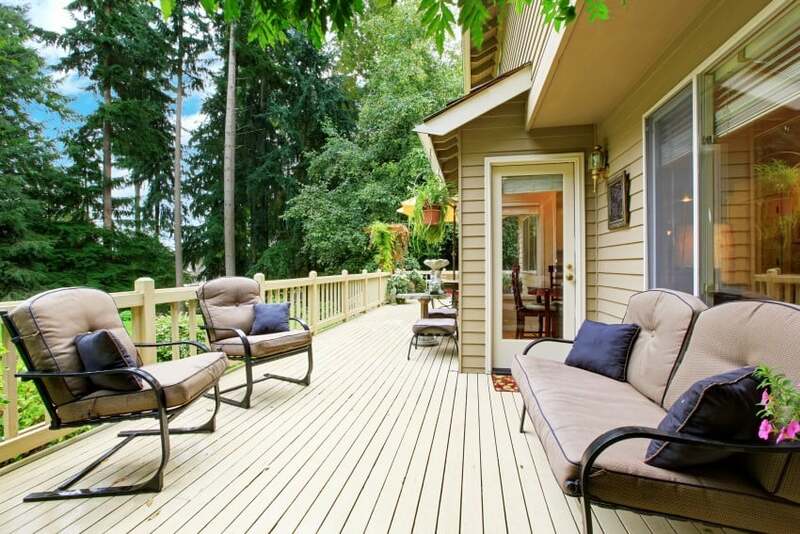 It is always great when your deck is large enough to accommodate various sitting areas. This one right here has a dining area on one side and a lounge corner on the other. It sure is a convenient solution for your everyday life. 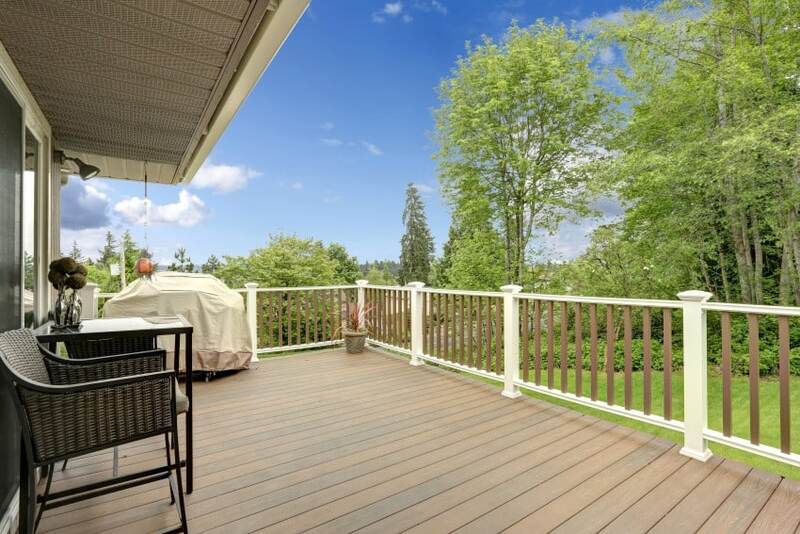 This wooden deck is slightly off the ground to allow for a magnificent view at the nearby landscape. Potted plants and blooming flowers are dotted all around the deck to spruce it up and bring nature even closer to you. 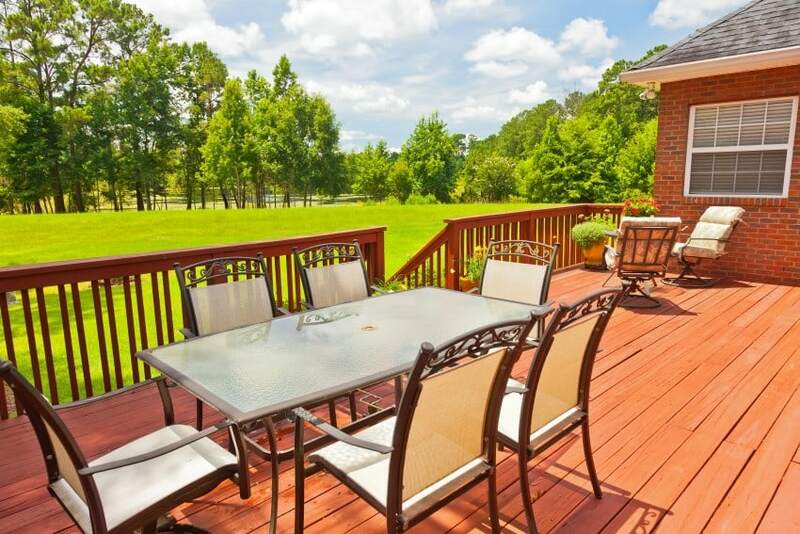 This large deck is big enough for two separate sitting areas. One of them is furnished with a dining table for the whole family, and the other one is more intimate with only a pair of lounge chairs. 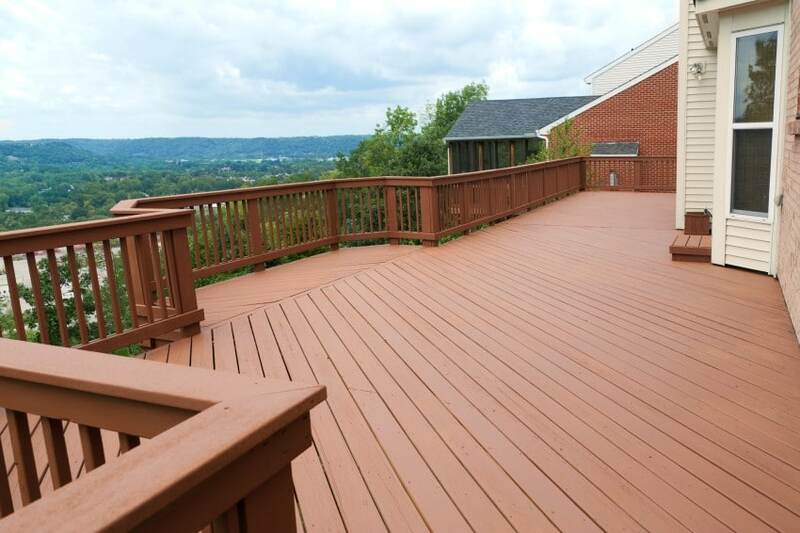 This deck is finished in red wood which goes great with the red brick exterior of the house that it is attached to. Wood and brick are always a nice match, as they are both natural materials that inspire a sense of comfort and cozy. 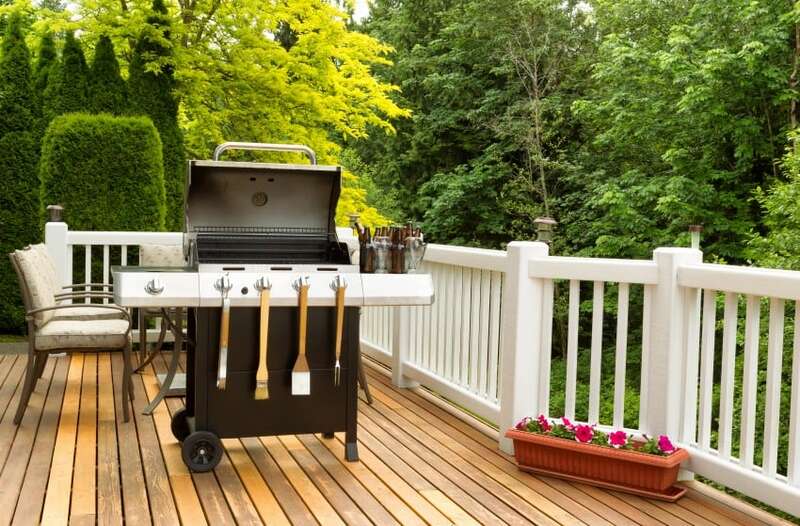 Here is a large deck that is set in light neutral shades – grey and white. It is partially covered by a roof overhang and accommodates a pair of chairs, a small table and a garden barbecue. Who could possibly resist that? 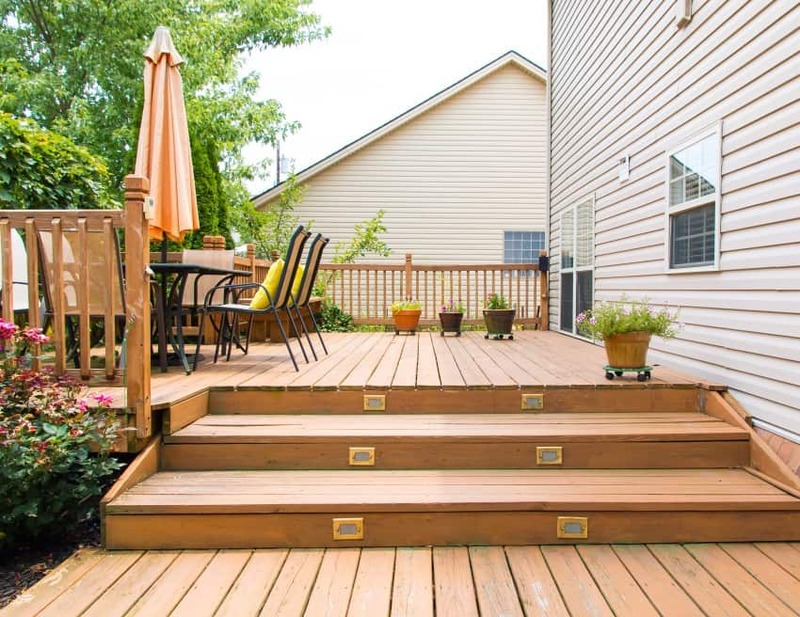 This large deck takes up two levels that are connected by small stairs. The lower platform accommodates a large pergola where a large dining area can be set up. The upper level is more private and furnished with a small bench. 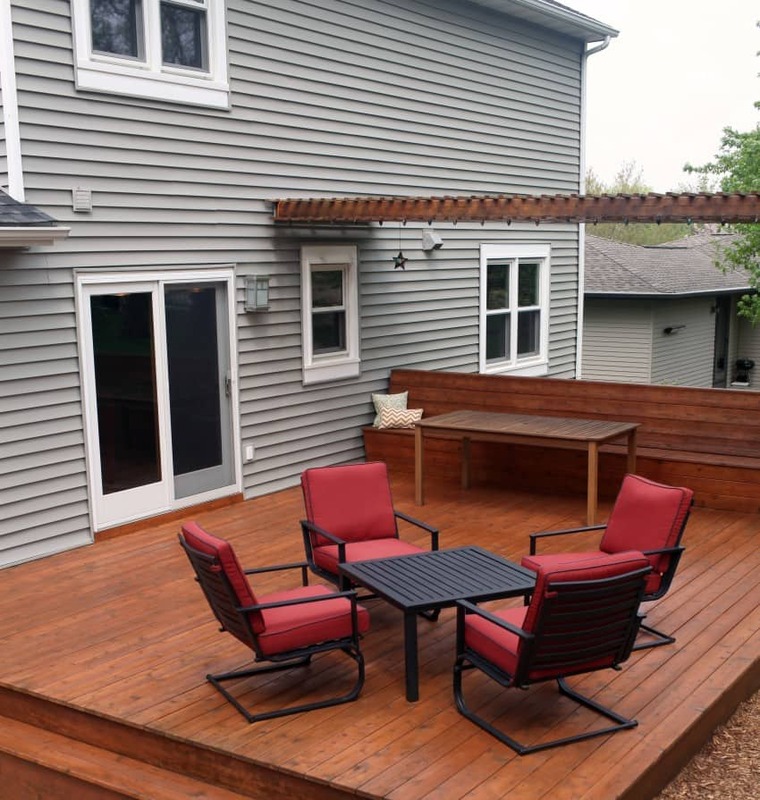 Here is another airy deck that is so large that it offers many seating options. A dining corner can be found at the far end, and a two-seat sofa is placed under the roof overhang. A lounge chair with a footstool is on the other side. 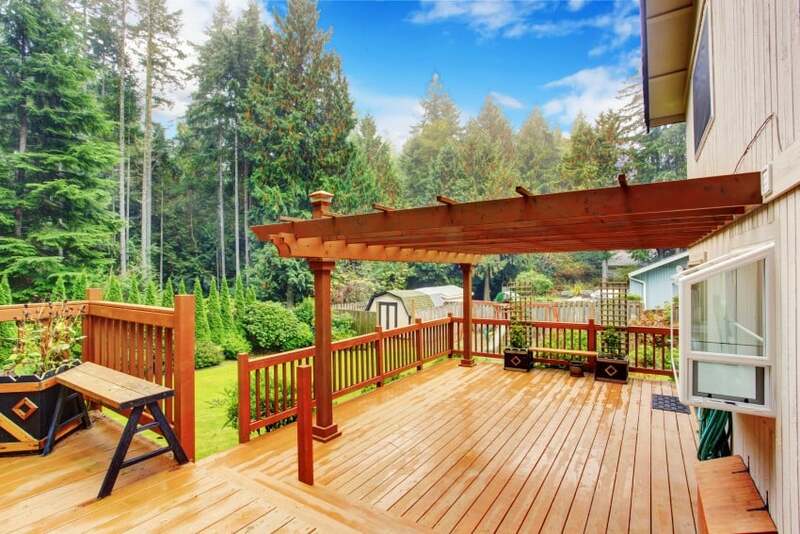 This large deck rests on a platform with three steps leading to it from the backyard. It is furnished with a dining table with six chairs and an umbrella, and is decorated with potted plants all around. 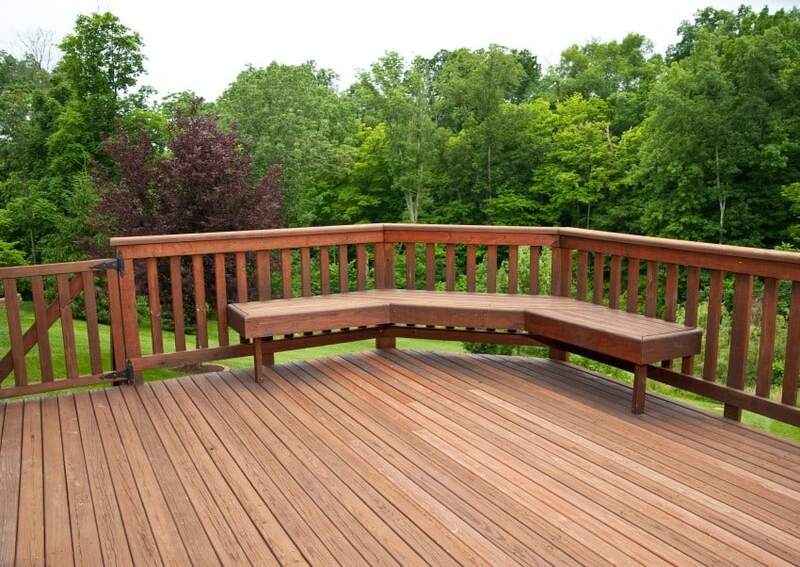 Here is another wooden deck that inspires a feeling of peace and quiet. 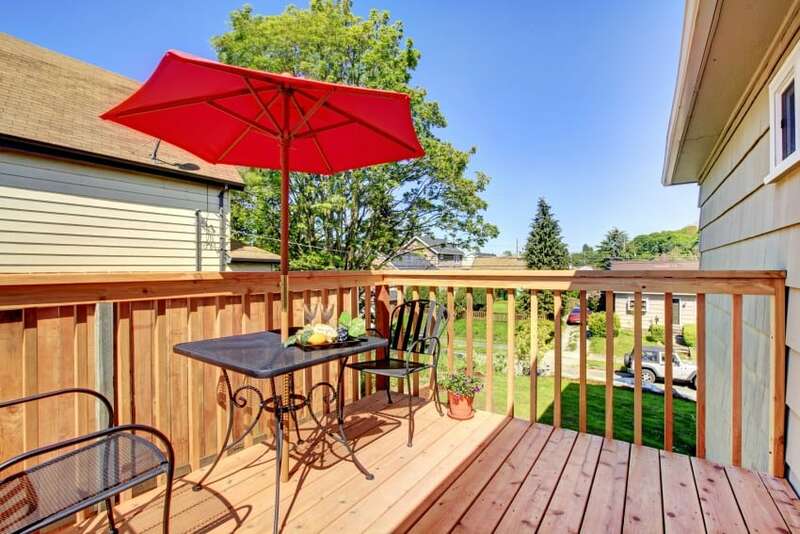 It flows into a beautiful backyard with a green lawn, and is also connected to an upper level balcony through a series of wooden stairs. 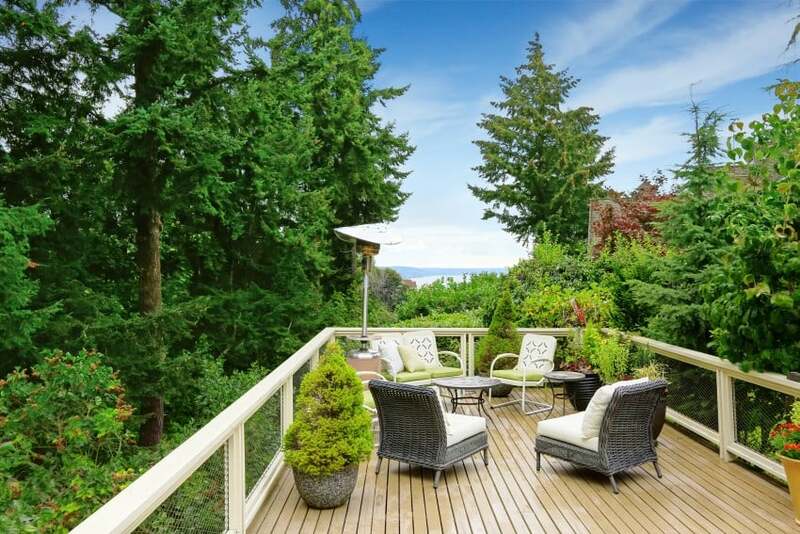 This wooden deck is immersed in greenery. It is on an elevated platform among trees and pines, and accommodates a lounge area with chairs and a table. It is by far the perfect place to unwind and enjoy nature. 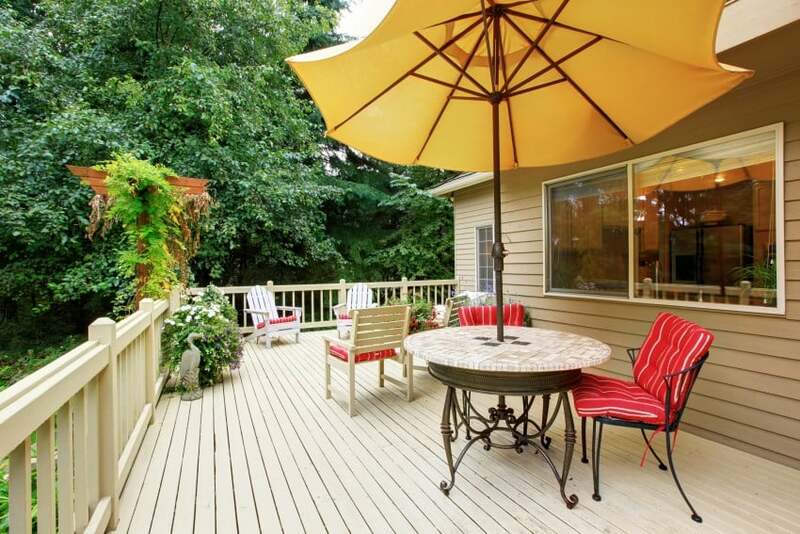 Here is another backyard deck with comfortable seating. The wood is finished in a neutral color finish that perfectly matches the exterior of the house. Red padded cushions, on the other hand, add a color burst and make a cool accent in the design. 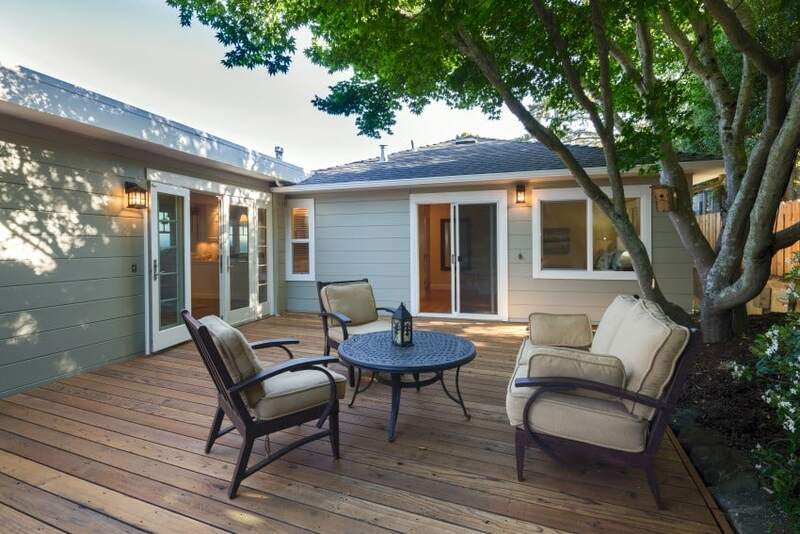 Another view of the same deck reveals a hidden corner with a set of chaise-lounges. This takes comfort of living to a whole new level, as there is no better way to enjoy the sun in your backyard than to casually lie down. Here is another deck design in a neutral color palette. It is immersed in green and is furnished with a set of arm chairs plus a two-seat sofa. What a nice place to spend some time with friends or family! 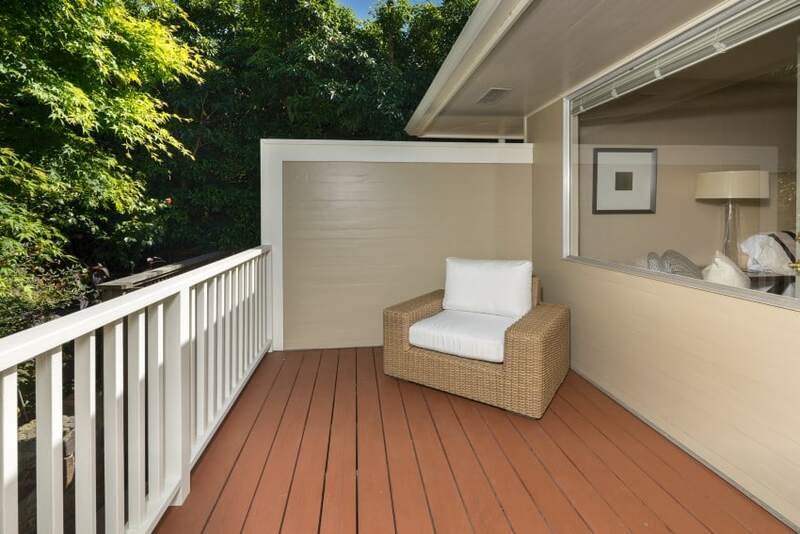 If you are more of a lone wolf and would rather have some privacy, then this is the right place for you – a nice deck with a single armchair just for you. This is a great way to clear your mind in peace and quiet. 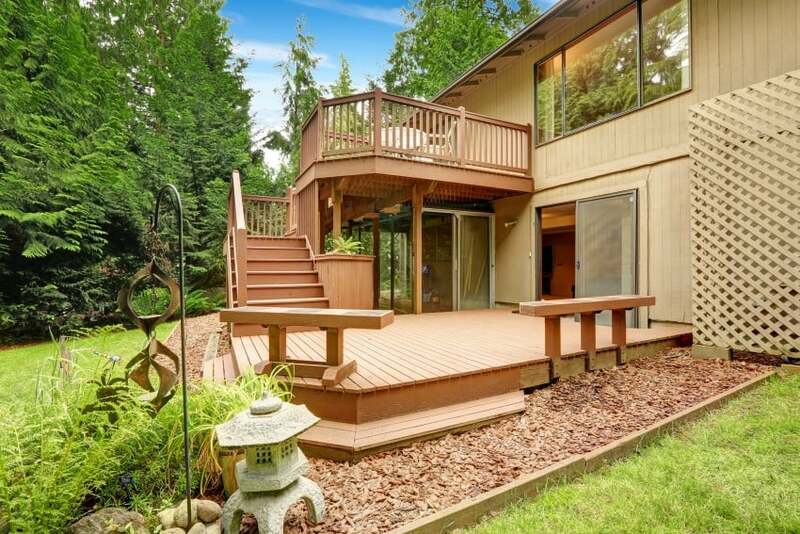 Here is another wood deck in a private backyard. It is quite simple and minimalist in design. 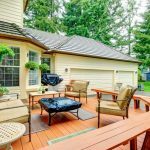 It is only furnished with a casual seating set under a large tree that makes a nice addition to the backyard and a great focal point in the design. Behold a nice backyard porch set in wood and white. It is furnished with a dining table with chairs and a large garden grill oven. It is also surrounded by lush greenery and a large variety of trees and shrubs. Here is another peaceful outdoor setting. 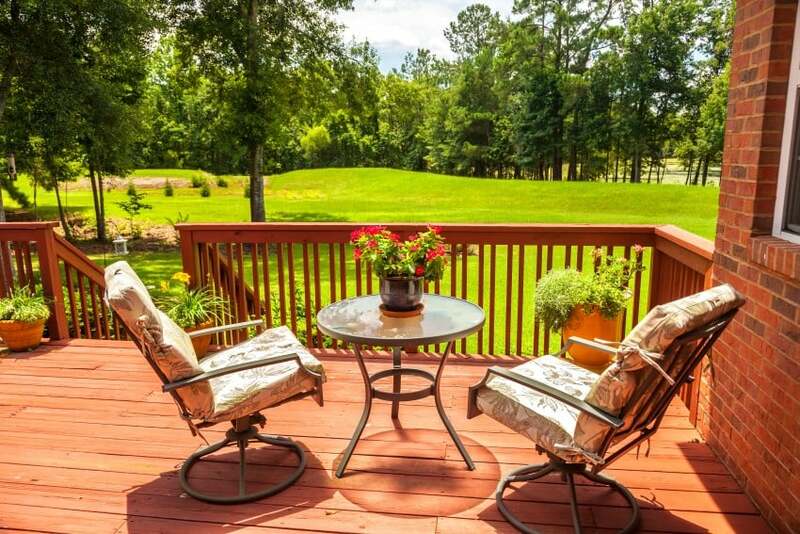 This large deck features wood flooring and white railing, and accommodates a cozy sitting area that overlooks a rural landscape. It is the perfect spot for a casual breakfast or a homemade dinner.